Happy Sunday! Right now I’m watching my beloved Cleveland Browns, sipping a cup of tea, and waiting for my newest video to finish uploading. I also have been working on some exciting changes to my blog, which were prompted by an amazing and (hopefully) life-changing event that happened yesterday. Posts on all of that are going to come in the future, but right now I have a new indie polish to show you guys! I was browsing around Etsy when I spotted Spy Princess Nail Lacquer. I was first drawn in by the bottle shape, as it brought back some great memories of many polishes that I purchased from Hot Topic years ago. Then I saw how gorgeous the polishes were and I had to contact Chrissy, the mind behind the creations! I purposely made the picture a little blurry so you could see the shimmer and holographic glitters! 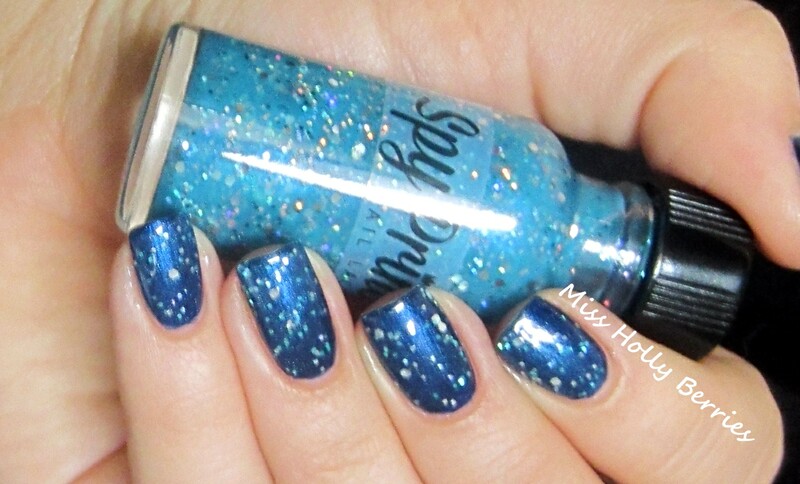 Spy Princess “High Society” is a sheer blue shimmer with chunky and small holographic glitters. This is one coat over Deborah Lippmann “Rolling in the Deep,” (review to come!) 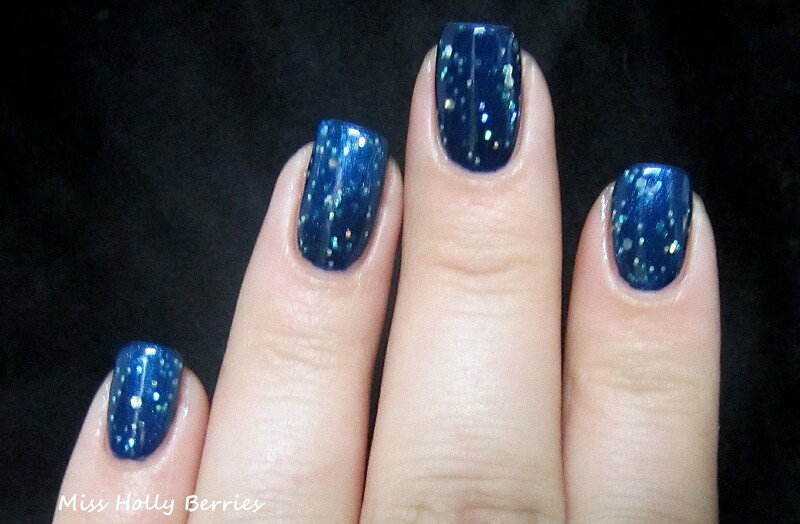 and it completely transformed the deep navy blue into a duochrome like galaxy on my nails! While I think you might be able to get this polish opaque on its own, it works amazingly as a glitter topper. The formula was really nice on this polish. It dried really quickly and didn’t dry to a rough texture. The only thing to report that was a little different was that the smell of the polish was a little different than other polishes. Not a bad smell, but something I noticed. Spy Princess Nail Lacquer is also 3-Free and really affordable. I think that was another thing that originally drew me to Spy Princess was the fact that it was under $10, which is kind of rare in the indie polish world. What do you guys think? What are your favorite new indies? Check out the Spy Princess Nail Lacquer on her Esty site! You can also like their Facebook! HUGE Nail Polish Haul!! Indies, Zoya, OPI and MORE! That looks stunning. I’ve recently started buying indie nail varnishes and I may have to invest in this one (as long as I can get it shipped to England…). hopefully you can! what indie brands have you tried? which are your favorites? The colour looks gorgeous. I love hearing about new and exciting nail polishes. Thanks for letting sharing! awww thanks! chrissy does make some gorgeous polishes!